The Sov'reign luxury caravan range introduces new standards of space, refinement and great value for money if you're looking at family caravans. The styling of these innovative luxury family caravans reflects not just the latest ideas but the most logical, combined with the extra flair you'd expect from Roma. 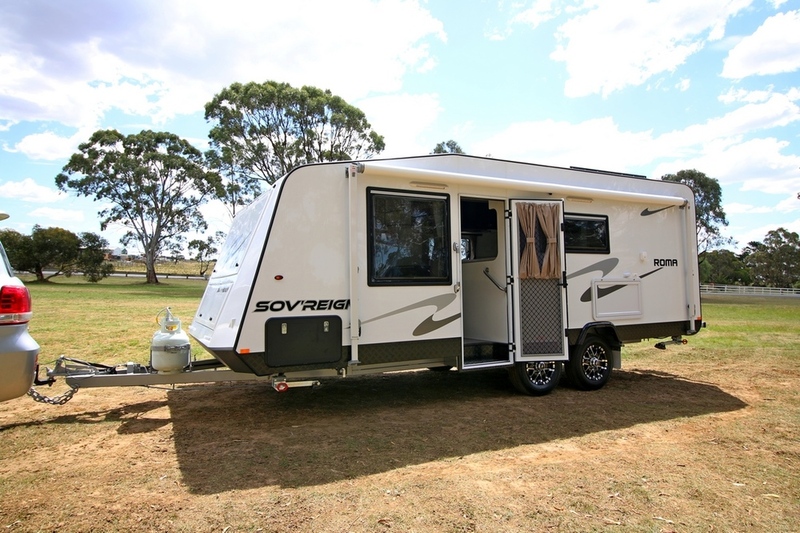 Offering comfort, flexibility and ease of use, the Sov'reign is the perfect touring caravan for the modern Australian family and will look right at home in your favourite caravan park or camp site. Built in Australia, we understand the changing needs of families and offer practical living spaces, essential mod cons, generous storage solutions and much more to make holiday caravanning and your next family road trip a pleasure, right from the start. Each elite luxury family caravan is built with care and to the highest level of strength, safety, and comfort. Roma offers a great warranty and provides quality advice from our friendly Melbourne sales team. Take a virtual tour of the Sov'reign - our elite range of luxury family caravans. Each family caravan is customised to suit you and your lifestyle. To get you started, take a look through some sample layouts to find one that is perfect for you. Interested in this model? Click the button below to arrange a time to explore Roma's Sov'reign family caravans in our Melbourne showroom.